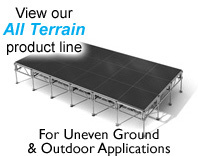 Watch our IntelliStage modular staging video and see how our simple and quick it is to set up a complete stage system. To Learn more about our IntelliStage System please visit our FAQ and About pages. 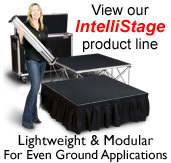 When it comes to professional truss systems, portable stage systems, choral risers, seated risers and ramps.Intellistage� is world renowned for creating the highest quality, most innovative modular staging products on the market today. A pioneer in modular staging and truss design, Intellistage continues to lead the market with innovative products and a wide range of product offerings. For over 25 years we have been crafting high quality, innovative products to make our customer�s lives easier. We welcome you to join our growing family of satisfied customers worldwide .We take pride in creating quality products that offer a great value.